Who “owns” Baltimore’s beat-up, poorly-air-conditioned schools? A Republican governor, a Democratic mayor, school officials and many others over many years, argues a parent. Now fix them! 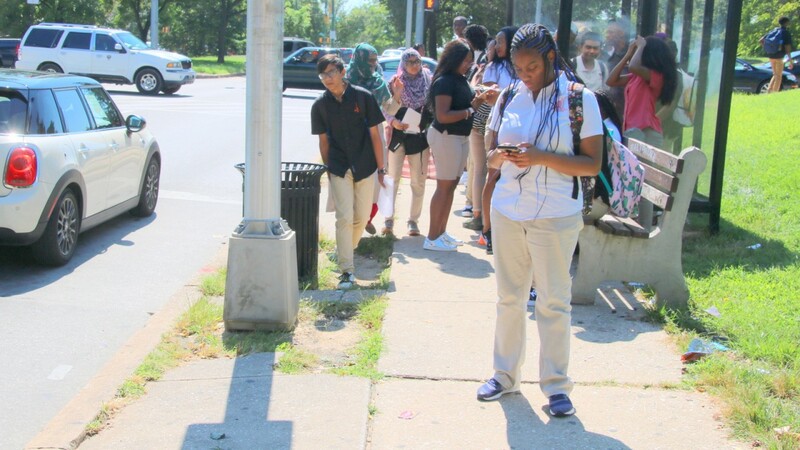 While Governor Larry Hogan was denouncing City Schools CEO Sonja Santelises this week and Mayor Catherine Pugh was tweeting platitudes (“our children deserve the very best schools and environments”), students were streaming out of overheated classrooms into the blasting Baltimore heat. I knew on Labor Day, when officials announced there would be early dismissal for scores of un-air conditioned buildings, that my 5th grader would be among those losing valuable seat time. How many other children, I wondered, would be leaving school three hours early? The answer is shocking: Over 36,000 children – more than 44% of all children enrolled in city schools – missed a half day of instruction on September 5. My calculation is conservative, by the way, since it’s based on the initial announcement that early dismissals were scheduled Tuesday for 60 schools. This was later updated to 72 schools. Today, for the fourth day in a row, midday dismissals continue, with more than 60 schools affected. Less than a year since our children – my daughter among them – shivered in their classrooms, the poor condition of Baltimore school buildings is again causing finger-pointing. 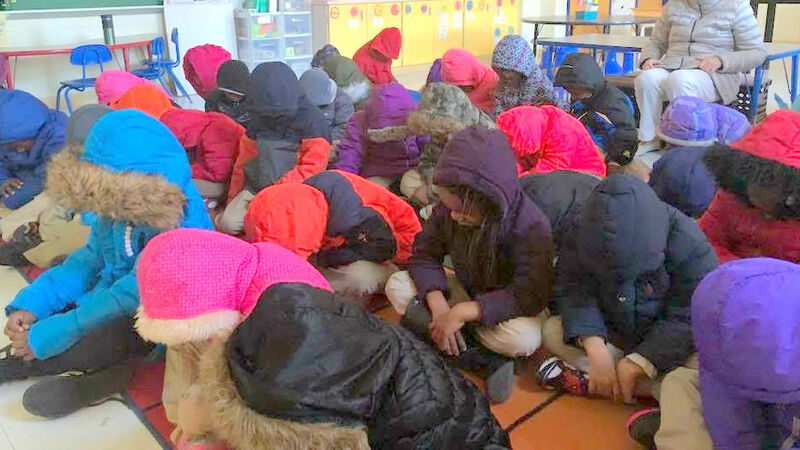 One of the photos of cold classrooms Baltimore teachers posted on social media in January. City Schools points to its empty pockets. Mayor Pugh blames a lack of state funding. Hogan blames mismanagement, with a soupçon of thinly-veiled racism. And Ben Jealous blames Hogan. Who let our children down and how? Let’s review the major players’ records, as assigning blame seems to be a necessary pre-condition to taking action. 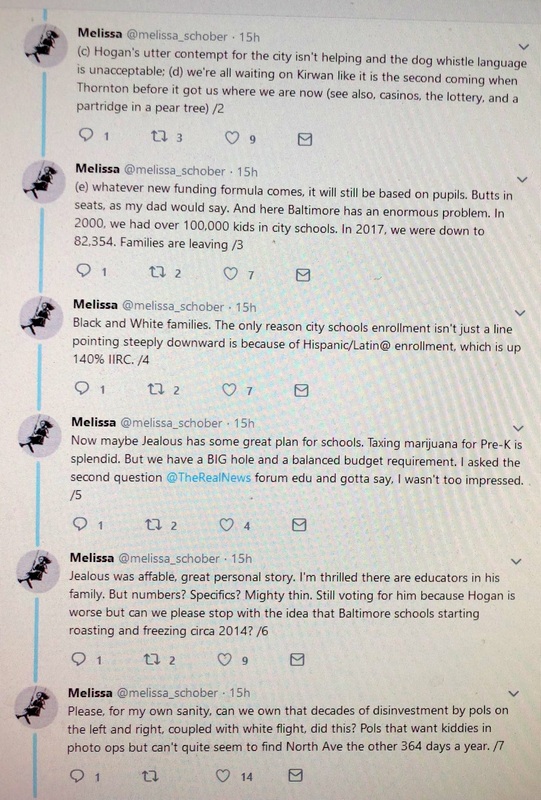 Tweet from a Baltimore teacher on the third day of classes dismissing early because buildings lacked air conditioning. Apart from the unacceptable dog-whistle language used to describe a majority black city led by an accomplished black CEO, Hogan seems increasingly irritated that the city won’t play Oliver Twist to his Mr. Bumble (“Please sir, I want some more!”). Hogan, you’ll recall, withheld $5 million in school construction from Baltimore City and $10 million from Baltimore County until they agreed to plans to add portable AC to schools over the next five years – aged wiring, inadequate insulation and electricity bills be damned. This, of course, followed his earlier decision to withhold $68 million in “Geographic Cost of Education Index” funds in 2015. 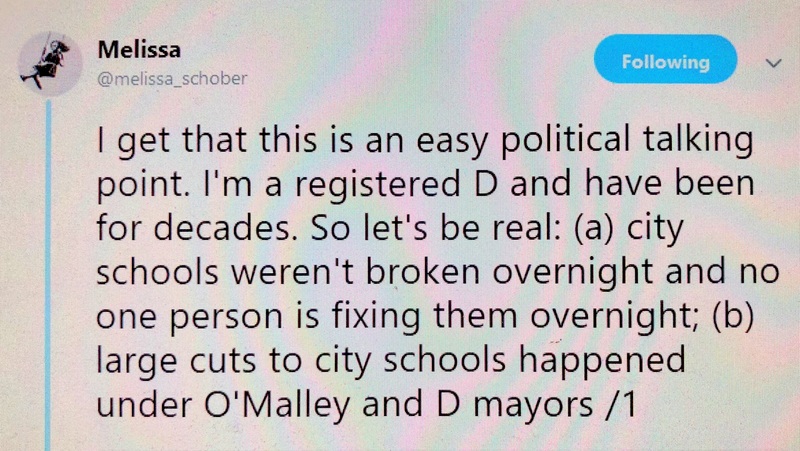 And his decision to fund Baltimore City’s Capital Improvement at $30 or so million a year – just about what he sent to other jurisdictions knowing full well Baltimore City schools are the oldest in the state, and at least 50 are in need of replacement. Baltimore receives most of its school funding from the state. Of the $17,211 per pupil in FY2018, the state contributes 70%. The local contribution is $3,645 per student, the fourth lowest of the state’s 24 jurisdictions. While Pugh promised during her 2016 campaign to significantly increase the city’s contribution to the school budget (at this forum and in this American Federation of Teachers questionnaire) she seems to have stopped paying attention. This shift occurred after she regained control of appointments to the city School Board in October 2017 and as soon as students stopped appearing above the fold in the national press. Pugh seems to have stopped paying attention. FY18 funding for the Baltimore Police Department was $493 million. She raised it to $509 million in FY19. Meanwhile, schools received $280 million from the city in FY18 and only $278 million in FY19. Of the city’s total $65 million spending for capital project bonds in FY19, only $19 million is directed towards the schools. For comparison, HVAC improvements for City Hall are scheduled to get $4.25 million in city capital bond funds ($250,000 in 2021, $2 million in 2022 and $2 million in 2023). The official retort is that we’re a poor city and we can’t afford more for city schools. To which I also say, why then did city officials worsen the problem by granting speculative real estate projects Tax Increment Financing? These special tax deals made the city appear more prosperous on paper than it really is and cost city schools some $50 million in state aid, before lawmakers corrected the formula. The nine-member School Board control the $1.3 billion budget for city schools. The Board hires and fires the CEO, who in turn hires and fires senior staff. Yet Keith Scroggins, the recently departed COO, managed to keep his job despite damning state reports, like the one in December 2017 that criticized schools maintenance for being “predominantly” reactive. From page 6 of the 2015 report of the Interagency Committee on School Construction on the administration of capital projects in Baltimore City. Yes, those reports were produced by the Hogan Administration. Embarrassed by the disclosure earlier this year that it had to return $66 million in school repair money for failing to use it on time, City Schools had an explanation. But it doesn’t let any of the adults here off the hook, really. The reasons were explained in a letter to the Knott Commission by School Board Chair Cheryl A. Casciani and City Schools CEO Sonja Brookins Santelises. Projects are taking too long to procure, they said, and they could not be funded because Baltimore city’s local contribution to capital improvement was so very, very low. Speaking of the O’Malley era, during the great recession, he cut the inflation factor mandated by the Thornton Commission/Bridge to Excellence. In 2008, members of the Baltimore Algebra Project denounced him for that move, which resulted in a $50 million budget shortfall for the schools the following year. If you want to talk about starving the schools, start with the City Councilman who rode a wave of juked crime stats all the way to Annapolis. Algebra Project members staged a “No Education, No Life” protest on the Statehouse steps that year, taking officials to task for failing to comply with a court ruling that found the state underfunded city schools by $400 million to $800 million between 2000 and 2004. By the civil rights group’s estimate, the state at that point owed the city school system $1 billion. I refer here to anyone who dares to say, or imply, that this problem was created circa 2014 under Hogan or even under O’Malley. Elections should not cause memory loss. 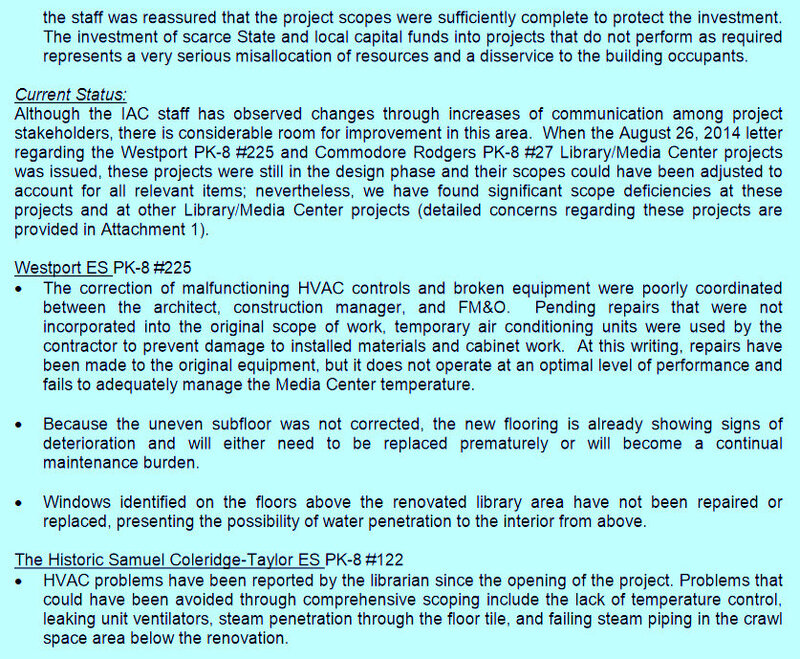 Public school condition reports dating from 2008 pointed to issues of concern, including HVAC, in city schools. The Jacobs Report in 2012 noted that the vast majority of city schools were in poor condition. A report from 2005 noted the state wasn’t able to fund all the capital improvement requests it received. I suspect others will recall or can document even earlier accounts. • Governor Hogan should immediately commit some portion – perhaps $100 million – of the $504 million surplus to Baltimore City schools. If packaging it up with some sort of accountability czar helps, I think 36,000 children are worth a political talking point. 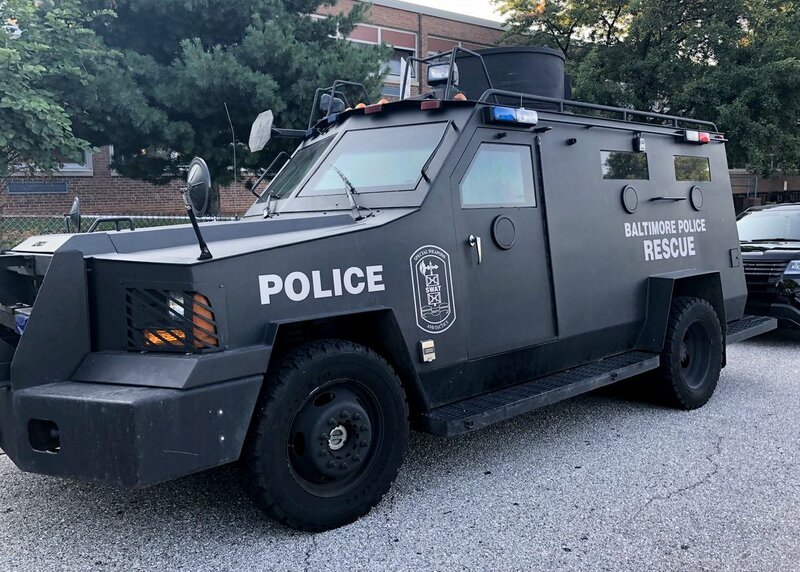 • Mayor Pugh should cut the budget for the Baltimore Police Department. I’d argue for a 20% cut, which nets another $100 million. We’re paying for more every year and getting less, as I noted here for The Brew. Merely keeping the BPD to their $20 million overtime allotment would save the city some $20-25 million, more than doubling her pitiful $19 million allocation to capital improvements. • Parents can enroll their kids in city schools, join the PTO, and visit the School Board every other Tuesday at 5 p.m. at 200 E. North Avenue. (Sign-in to speak opens at 4:30 p.m.) You may see me there. The mayor should cut the budget for the Baltimore Police Department. I’d argue for a 20% cut. In 2000, Baltimore City had over 100,000 children enrolled in city schools. Today, perhaps 80,000 children are enrolled. Whatever Hogan or Pugh, or even the Kirwan Commission decides, we have a large problem: declining enrollment. A $248,700 contract awarded to DeJong Richter to study the feasibility of rezoning estimated that another 2,112 students would leave the district over the next 10 years. Whatever bolus of money might come today, future educational dollars are tied to pupils. Fewer pupils, less money. So here we are. Yes, money will fix the physical plant. But it won’t fix our declining population. For that, we need something vanishingly rare: Someone who cares. Even when it isn’t campaign season.